Statistical learning is the process of identifying patterns of probabilistic co-occurrence among stimulus features, essential to our ability to perceive the world as predictable and stable. Research on auditory statistical learning has revealed that infants use statistical properties of linguistic input to discover structure--including sound patterns, words, and the beginnings of grammar--that may facilitate language acquisition. Research on visual statistical learning has revealed abilities to discriminate, learn, and generalize probabilities in visual patterns, but the mechanisms (including developmental mechanisms) underlying infant performance remain unclear. This talk will present new work that examines competing models of statistical learning and how learning might be constrained by limits in infants’ attention, perception, and memory. Broader implications for theories of cognitive development will be discussed. Scott Johnson, PhD, is Professor of Psychology at UCLA and a member of the Semel Institute for Neuroscience and Human Behavior. He received his PhD in 1992 from Arizona State University, followed by a postdoctoral fellowship in the Center for Visual Science at Rochester. 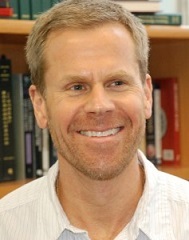 Prior to his current position at UCLA, he was an Associate Professor at NYU and an Assistant Professor at Cornell. His first job was as a Lecturer at Lancaster University, UK, where he is now a Visiting Research Fellow. His research concerns the origins and development of perception and cognition in humans, with a focus on attention, speech perception, face perception, object knowledge, learning mechanisms, brain development, and developmental disabilities. Scott Johnson is now director of the UCLA Baby Lab, where his research concerns the origins and development of perception and cognition in humans, with a focus on on attention, speech perception, face perception, object knowledge, learning mechanisms, and brain development.